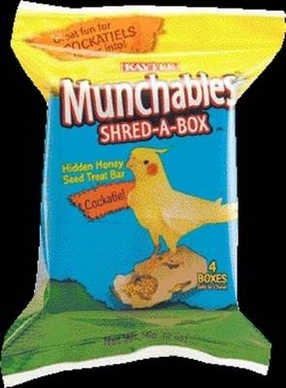 Home > Popular Category > Bird Supplies > Bird Treat > Munchables Shred A Box Treat For Cockatiels - 3" X 2" X 6"
Kaytee Munchablesshred-A-Boxwith A Honey Seed treat Is A Fun Way to Let Your Pet Discover A Hidden Treasure to Eat. Four Single-Serve Boxes Provide the Ultimate Mix of Nutrition, Stimulation and Fun! Simply Unwrap the Outer Packages Empty the Packet of Exact with Fruit On top of the Timothy Hay and Present to Your Pet. The Tray Is Intended to Be Left In the Cage After the Food Is Gone the Material Is Safe For Your Pet to Chew Instinctively. Your Birds will Love to Explore this Food. Product is made with White Millet Sunflower Canary Grass Seed Flax Seed Red Millet Safflower Corn Sugar Oat Groats Glycerin Gelatin Wheat Corn Syrup Buckwheat toasted Wheat Flakes Dehulled Soybean Meal Corn Gluten Meal.